The Mariners have released right-hander Pat Light from Triple-A Tacoma, as Tacoma Rainiers broadcaster Mike Curto tweets. The hard-throwing Light once rated among the better farmhands in the Red Sox system and was traded to the Twins in the 2016 Fernando Abad swap, but his control issues have prevented him from carving out a role in the big leagues. Light logged 16 2/3 innings between Boston and Minnesota in 2016, and while he struck out 16 batters in that time, he also issued 16 walks. Light’s strikeout rate plummeted with the Triple-A affiliates for the Pirates and Mariners last season, and in three innings with Tacoma in 2018, he issued eight walks and hit two batters. The White Sox released former first-round pick Courtney Hawkins yesterday, as first tweeted by FutureSox.com. Now 24 years old, Hawkins was the 13th overall pick of the 2012 draft. The outfielder, who endeared himself to many fans with his draft-day backflip, showed promise through the Class-A Advanced level but has seen his bat stall out in several attempts in Double-A. Hawkins has spent parts of the past four seasons (including 2018) with Chicago’s affiliate in Birmingham, Ala. but has slashed just .209/.265/.355 in 1136 plate appearances there. The Mariners have outrighted right-handed pitcher Pat Light, per a club announcement. That opens a 40-man roster spot, though it’s not immediately clear whether the team has plans for how to use it. Seattle claimed the 26-year-old Light off waivers from the Pirates just under two weeks ago, though his stay on the 40-man was brief. Light has gone from the Red Sox to the Twins (in exchange for Fernando Abad) to the Pirates (for cash) to the Mariners all in a span of roughly 11 months. It’s not hard to see the appeal of Light, who runs his fastball up to the upper 90s and averages nearly 95 mph on the pitch. He’s had no trouble missing bats in the minors and turned in a tantalizing 2.37 ERA with 9.9 K/9 against 4.5 BB/9 in 38 Triple-A frames last season. However, control problems have plagued the hard-throwing Light throughout his career (63 walks in 99 Triple-A innings), and he’s posted particularly unremarkable numbers in Triple-A this season. Through 28 innings between the Triple-A affiliates for the Pirates and Mariners, Light has a 4.82 ERA with a greatly diminished 6.4 K/9 rate and a still-problematic 5.8 BB/9 rate. The Mariners have announced they’ve claimed righty Pat Light from the Pirates and assigned him to Triple-A Tacoma. They’ve also outrighted righty Ryne Harper to Triple-A Tacoma. The Pirates designated Light for assignment last Saturday. The reliever is a former first-round pick of the Red Sox and has tantalizing velocity, but he has long struggled with his control, as his 5.1 BB/9 this year for Triple-A Indianapolis suggests. The 26-year-old pitched briefly in the big leagues for the Red Sox and Twins last season and allowed 22 runs in 16 2/3 innings, though he did average 95 MPH with his fastball. The Mariners selected the 28-year-old Harper’s contract late last month, then optioned him to Tacoma before he threw a pitch for them. He has pitched parts of seven seasons in the minors but has never appeared in a big-league game despite having been on a big-league roster and being part of a trade for a big-leaguer (the 2015 deal that sent Jose Ramirez to Atlanta). He has, however, fared well this season for Tacoma, posting a 3.00 ERA, 10.9 K/9 and 4.5 BB/9 24 innings there. The Pirates announced that they’ve acquired hard-throwing right-hander Pat Light from the Twins in exchange for a player to be named later or cash. To make room on the 40-man roster, the Pirates designated fellow right-hander Lisalverto Bonilla for assignment. Minnesota had designated Light for assignment last weekend when they claimed infielder Ehire Adrianza off waivers. It seems as if the Twins will be receiving cash, as opposed to a player, as Minnesota’s announcement made no mention of a possible PTBNL. Light, 26 next month, long rated as one of the more promising farmhands in the Red Sox organization, but Boston parted ways with him to acquire southpaw Fernando Abad prior to last year’s non-waiver trade deadline. Light made his big league debut last season but allowed 22 runs in 16 1/3 innings with 16 strikeouts against 16 walks. Control has been an issue for Light in the past two minor league seasons, as he has walked 56 batters in 100 2/3 innings in that time. He did, however, average nearly 95 mph on his fastball during his brief 2016 call-ups, and he also logged a 54.4 percent ground-ball rate. Both factors likely piqued the interest of the Pirates, who place a heavy emphasis on ground-ball tendencies. Bonilla, 26, hasn’t appeared in the Majors since 2014. The former Phillies/Rangers prospect underwent Tommy John surgery in 2015 but worked his way back to health with the Dodgers’ Triple-A affiliate in 2016. In 111 innings split between the Double-A and Triple-A affiliates of the Dodgers, Bonilla logged a 3.97 earned run average with a 118-to-40 K/BB ratio. His short stint in the Majors back in 2014 resulted in a 3.05 ERA and a 17-to-12 K/BB ratio in 20 2/3 innings. The Bucs had signed Bonilla to a Major League deal earlier this offseason. The Twins have claimed infielder Ehire Adrianza off waivers from the Brewers, as per a team press release. To make room on the 40-man roster, Minnesota designated right-hander Pat Light for assignment. Adrianza has now been designated for assignment and claimed on waivers twice this week, as Milwaukee claimed him from the Giants on January 31. The Giants DFA’ed the 27-year-old to make room for Nick Hundley, while the Brewers quickly designated Adrianza themselves after claiming Jesus Aguilar off waivers from Cleveland (though Brewers GM David Stearns said that his team was hopeful of keeping Adrianza if he cleared waivers). Adrianza has a .220/.292/.313 slash line over 331 career plate appearances in the big leagues, all with San Francisco from 2013-16. While the switch-hitter has never delivered much at the plate even at the minor league level, Adrianza has displayed defensive versatility as a shortstop and second baseman, plus a handful of games at third. He’ll join a fellow switch-hitter in Eduardo Escobar as the Twins’ primary reserve infielders, and while both could end up competing for a lone job, the Twins could have particular need for infield bench depth. Miguel Sano’s ability to handle third base is still up in the air and Jorge Polanco is still largely unproven as a major leaguer. Polanco will obviously get a lot of time to prove himself, though Sano could ultimately be moved to DH if he can’t manage to be at least passable at the hot corner. Light, 25, made his MLB debut in 2016 and had a rough introduction to the Show. The righty posted an 11.34 ERA over 16 2/3 innings with the Twins and Red Sox, allowing four homers in his brief amount of mound time and issuing as many walks (16) as strikeouts. The hard-throwing Light came to Minnesota from Boston at the trade deadline in exchange for Fernando Abad. The 37th overall pick of the 2012 draft, Light posted a 4.35 ERA, 7.4 K/9 and 2.16 K/BB rate over 297 2/3 IP in the minors, though his results improved after being moved to full-time bullpen work in 2015. The Red Sox have struck a deal with the Twins to acquire left-handed reliever Fernando Abad in exchange for hard-throwing right-handed relief prospect Pat Light, the teams announced. 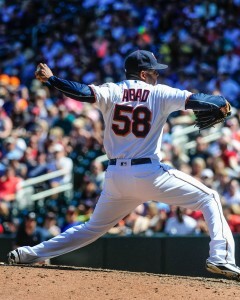 Abad, 30, joined the Twins on a minor league deal this offseason and has performed quite well with Minnesota, pitching to a 2.65 ERA with 7.7 K/9, 3.7 BB/9 and a 45.2 percent ground-ball rate in 34 innings of work. He’s admitted to having been bothered by a minor back issue in early July/late June, but the medicals clearly checked out in this case. 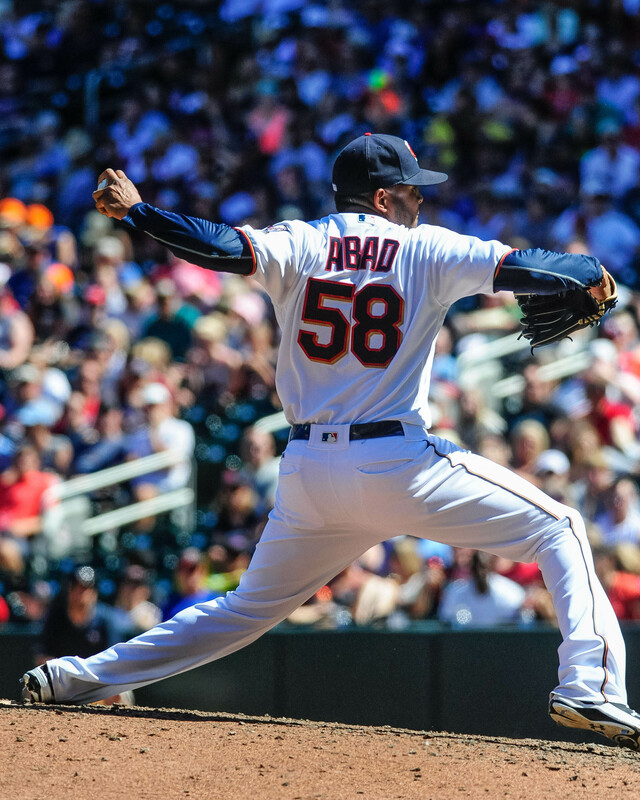 That’s perhaps not surprising, as Abad never landed on the disabled list and has been used frequently by the Twins as of late, suggesting that any such troubles are behind him. Left-handers are batting a woeful .163/.192/.265 against Abad this season, so he’ll provide manager John Farrell with a legitimate weapon against lefty bats in late-game settings. And, while he’s been markedly worse against righties, Abad has held his own against opponents that hold the platoon advantage, limiting them to a .257/.360/.351 batting line. While the OBP is a concern there, he hasn’t allowed right-handed hitters to generate much power against him. Abad is earning $1.25MM this season and is under club control through the 2017 campaign via arbitration, so he represents more than just a rental pickup for president of baseball operations Dave Dombrowski, who has now bolstered his roster with summer pickups of Aaron Hill, Drew Pomeranz, Brad Ziegler and Abad. Light, 25, was the 37th overall pick in the 2012 draft and made his big league debut with Boston this season, tossing just 2 2/3 innings in a pair of relief appearances. Light was rocked for seven earned runs in that time but is a fairly well-regarded prospect within the Red Sox ranks, rating 10th on Baseball America’s midseason rankings and 14th on MLB.com’s same version of that list. Light’s fastball reaches triple digits on occasion and sits in the 94-98 mph range, per MLB.com’s report, and BA calls his fastball a “special” pitch. His control remains a work in progress, but MLB.com notes that the addition of an above-average splitter has helped his results take off in the minors. Light has a 2.32 ERA with 36 strikeouts in 31 innings at Triple-A this season but has also walked 17 hitters (one unintentional) in that time. Jon Heyman of FanRag Sports first reported that the Red Sox were getting Abad. (Twitter link). Mike Berardino of the St. Paul Pioneer Press reported that the Twins were receiving Light in return (via Twitter).